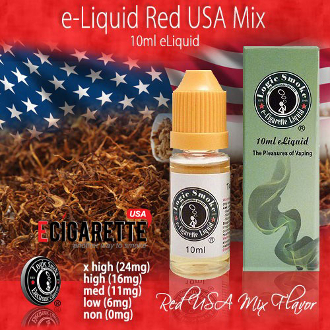 Our e liquid USA Red Mix flavor from Logic Smoke is a bold tobacco flavor that is a wonderful alternative for anyone who is a red label cigarette smoker. Its flavor is modeled after an American cigarette brand originally popular with cowboys that quickly became the favorite red flavored cigarette in the USA. Pick up a bottle of e liquid USA red mix and satisfy your cigarette cravings without the tar and ash.